Bifacial solar modules are making a comeback, of sorts, as the PV industry looks to squeeze more out of current solar cell technology. On the heels of Sunpreme revealing their 500W bifacial modules and MegaCell’s manufacture of 18% efficient polycrystalline bifacial cells, bifacial PV looks to work its way towards a larger share of the PV market. What is a bifacial solar cell? 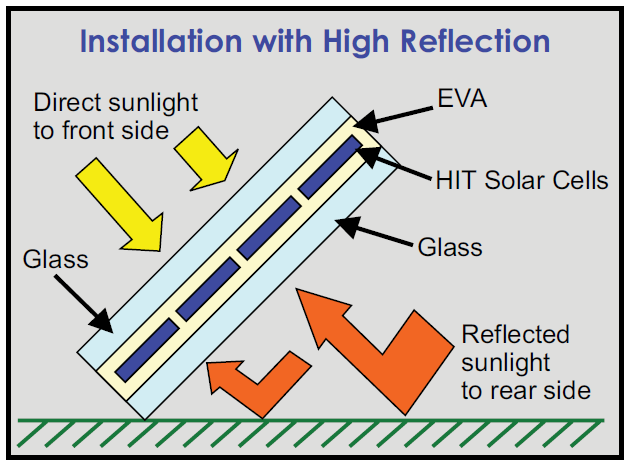 Bifacial solar cells are designed to allow light to enter from both sides. They typically employ a front surface design similar to that used in industry‑standard screen printed solar cells, with the major point of difference being the structure of the rear surface contact. Rather than cover the entire back surface with a reflective aluminium contact, a ‘finger’ grid is used in its place in order to allow sunlight through the rear. 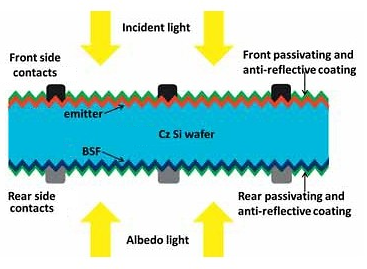 Typically, the silicon material used for bifacial solar cells must be of superior quality such that photogenerated electric charges near the rear surface can contribute to power production as they travel towards the ‘emitter’ on the front surface. This design also necessitates the use of transparent encapsulating materials (i.e. glass) on both sides of modules. Historically, bifacial solar cells were targeted towards BIPV applications or in areas where much of the available solar energy is diffuse sunlight which has bounced off the ground and surrounding objects i.e. extreme latitudes and snow‑prone regions. 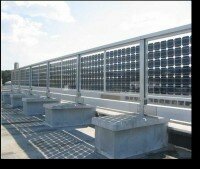 However, the combination of plateauing peak efficiencies from standard screen printed solar cells and significant reductions in the cost of solar glass in recent years – making the use of double‑sided glass encapsulation viable – has pushed bifacial solar modules back into the spotlight. 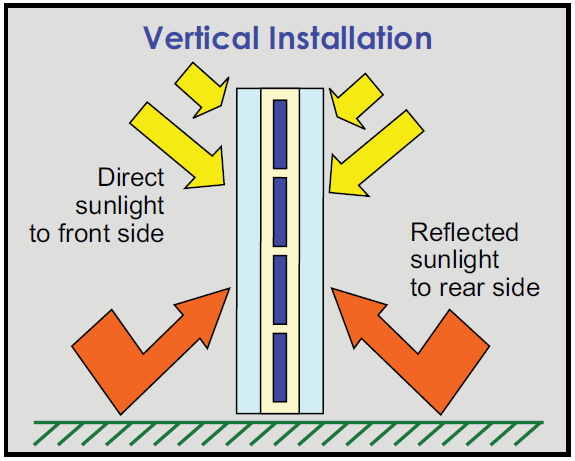 In order to better match onsite demand with PV generation profiles throughout the day – a desire stemming from the sub-par feed-in tariffs offered by most Australian retailers – some consumers have opted to use an east-west panel orientation, where half of the panels are tilted eastwards to create a generation peak in the morning and the remaining half is tilted westwards to also allow for a generation peak in the afternoon. This ‘double-peak’ profile can better match onsite electricity use, especially for residential and commercial installations. This unconventional approach can go one step further if we instead use vertically‑installed east‑west‑facing bifacial modules, which would more than halve the number of modules needed for an equivalent installation. This configuration would again produce two generation peaks but would also benefit from the additional diffuse light entering the module from the indirect side. The electricity generation profile would, on average, behave as shown in the second schematic below. In comparing the financial merits of single-sided against bifacial modules, the effective levelised cost of electricity (LCOE) over the project lifetime should be used as the deciding metric and not just the dollars‑per‑peak‑watt cost of respective modules. 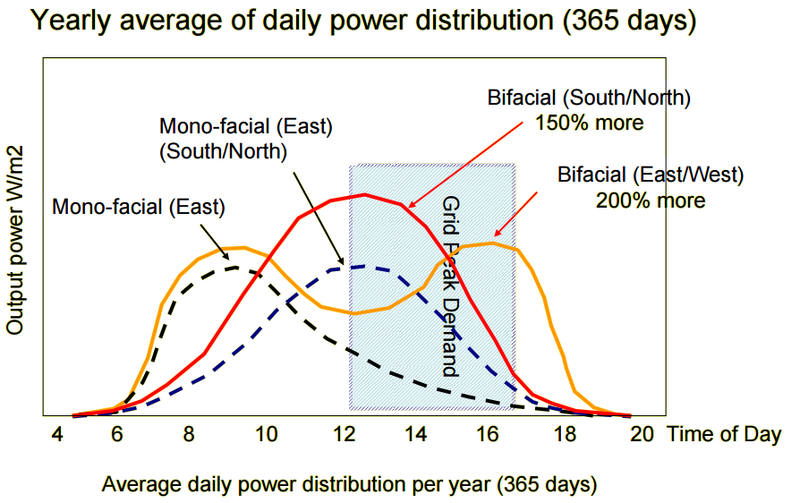 For grid-connected PV consumers, the ability to more closely match PV generation profiles with onsite demand throughout the day – thus maximising the use of generated PV electricity rather than feeding it back into Australian grids at reduced rates – can boost returns on a PV investment, despite a marginally higher upfront cost with bifacial technology. John regularly contributes original technology articles to Solar Choice News. He is a PhD candidate in solar PV engineering at the University of New South Wales (UNSW), having graduated with First Class Honours in a Bachelor of Engineering (UNSW, specialising in PV). His knowledge of and passion for renewables technology led to him receiving the federally-funded Australian Postgraduate Award and Engineering Research Award for research excellence, in addition to being a Co-operative Program scholar during his undergraduate studies. John also works as an energy efficiency and process engineer and analyst. Just curious, what are your thoughts regarding using Bi-facial solar modules on a tracking mount? I manufacture such a tracking mount, tracks in two axis, and am trying to figure out the added power produced by a Bi-facial module. This is an interesting problem because the amount of reflected energy during the day varies with the position of the sun in relation to the horizon. So the panels, if tracking the sun exactly, receive very little reflected energy in the early AM or near sunset when the suns light is at a low angle to the earths surface. (With the addition of mirrors to my mount this condition could be improved somewhat). With the addition of reflective mirrors, that always take the reflected energy and point it back, at just the right angle, to the backside of the Bi-facial modules, I should be the most efficient PV energy system to date. Because of your impartiality, it would be interesting to send you the data on my PV installation and get your opinion on how its doing. I live near Tucson Arizona USA, where we get a tremendous amount of sunshine. I have my mounts up and running, and will be installing Bi-facial panels in the next three weeks. Initially, I’ll run the panels without the mirrors, and then with the mirrors to measure the difference in energy produced. Send me a message to let me know you received this post. A warm hello from the Philippines! Bifacial solar panels are now being marketed here in my country. Like your place, we also have plenty of sunlight here. I wonder if you may share me your experience with your bifacial solar panels w/ solar trackers as I am interested in installing these panels in my place. Thank you in advance & hope to hear from you soonest.